I laughed. I raged. I laughed harder. I may have punched my keyboard a few times. My first few hours with Ben and Ed had me trapped in a whirlwind of self-mutilation as I was doomed to repeat my mistakes over and over until finally, my limbless torso flopped helplessly through the next checkpoint. I’d then reassemble and plunge right into the next nightmare because this 3rd person jump and run adventure is addicting. Ben and Ed, by developer, Sluggerfly, is a story of friendship between two very unlikely individuals, set in a futuristic dystopia. Ben, a young boy, befriends Ed, the first undead. When evil game show host, Hans Showmaster learns of Ed and his unbreakable friendship, Ben is taken prisoner, thus forcing Ed to tackle horrific obstacle courses in hopes of rescuing the only person that cares about him. It’s a heartbreaking story, demonstrating how there truly is nothing that can stand in the way of a zombie and his pal. The stakes are high as Ed takes his plunge into the twisted and corrupt game show that is “Rundead”. As Ed, the undead protagonist, your goal is to navigate long obstacle courses from checkpoint to checkpoint, whilst doing your best to avoid spinning blades, swinging mallets, powerful bosses, laser beams, saw blades, flying sharks… you get the point. And as a zombie, you’re expected to lose a few limbs here and there. Many times I’ve been reduced to only a decapitated head, rolling and bouncing frantically towards the finish line. But at each checkpoint all previously lobbed off parts are reattached to Ed so he can continue losing them. Though majority of my many, many deaths have occurred as a result of carelessness, I’ve also found myself in situations where I’m forced to rely on dumb luck. I’m referring to areas on the map that are so poorly lit that I can barely see the blade coming before I’m a double-amputee. The game is hard enough as it is; at least let me see what’s killing me! Also, in level 5, “Everybody Loves Clowns”, I had a hard time learning the boss mechanics as there were just so many unforeseeable ways to die. As you work your way up to the first floor of a spiraling Panopticon, a giant clown in the center of the room smacks the floor, causing Ed to spring into the air. Upon reaching a certain height, the boss mechanics change and he swipes his hand around in circles, assuming you are already prepared to jump. I’ve had quite a few instances where he’s smacked the ground, launching Ed just a few inches off the ground, yet high enough to trigger his second attack pattern. The effect is an unavoidable Donkey Kong, karate chop combo. Sometimes I benefit, and land on a much higher platform, but I can’t see it as a reliable exploit as the sonovabitch randomly changes attacking directions after you land your first successful attack. *deep breaths* and this is only the beginning of my gauntlet. Again, most of my mishaps had only to do with poor timing. Overall, Ben and Ed deliver a fast paced challenge that often reminds me of my more frustrating Dark Souls and Super Meat Boy moments. 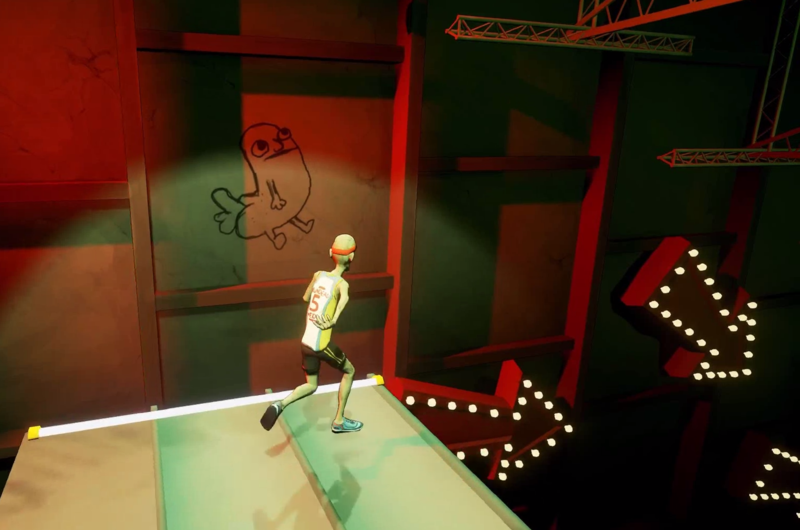 Subtle Easter Eggs thrown into the mix, like a surprise dickbutt that I have yet to discover, diffuse tension and remind you just what kind of game you’re playing. I had no idea how satisfying it could be to stomp on a chicken until I was hopping on one leg through a mist of poultry guts. The gratifying rush of barreling through an obstacle course with a perfectly timed sprint and only missing an arm (or two) keeps me somewhere between anticipation and fear of what’s to come.